This being the Town of Oyster Bay, and the first meeting of its reconstituted Board of Ethics to boot, some friction was inevitable when the board held its inaugural public meeting on March 13 at the Town Hall. Two of the town government’s most vocal critics, Robert Ripp of Massapequa and Kevin McKenna of Syosset were in attendance. They made a number of critiques during the public comment portion, including objecting to the role of the board’s counsel, Steven Leventhal, a Town of Oyster Bay independent contractor considered a specialist in the field of government ethics. The two immediately focused on the absence of board member Carolyn Mazzu Genovesi of Glen Head, who, according to member Alfred Constants III, “was not able to accept her assignment.” The lone Democrat on the appointed board had not been at the town board meeting where members were introduced (she reportedly was away on vacation) and had not been sworn in. Supervisor Joseph Saladino had touted the political diversity and independence of the board, and Leventhal emphasized that this diversity (no more than two members of a political party) was something new in his experience. McKenna wondered why Genovesi had not been replaced in the meantime, being that more than 20 people had been interviewed for the board, and felt her absence should have been addressed at the beginning of the meeting. Ripp asserted that the board had violated Robert’s Rules of Order. Leventhal responded that the body was not bound by those rules. Among the actions taken by the board was to choose Constants as chair. The Locust Valley resident serves as the vice chair of the Ethics Committee at the Nassau County Bar Association. 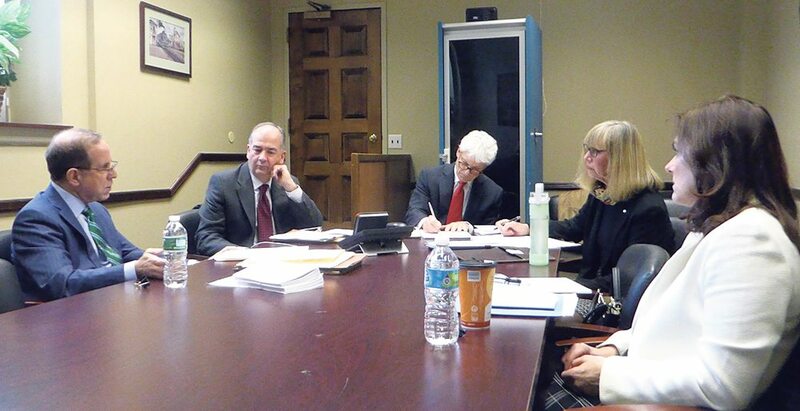 Leventhal spent a good chunk of the nearly two-hour meeting detailing some of the philosophy underlying the ethics program, as well as nuts and bolts of how the board should operate. Education, training and prevention were the main functions of the board. Among its duties will be to administer the financial disclosure forms required of all elected public officials, department heads and selected other employees. Leventhal said he would draft for board review and approval a set of procedural rules to use when conducting investigations. Also in attendance were members Margaret Eaton of Hicksville and Mary Sanchez of Syosset. Neither has a political affiliation, and with Harrison and Constant both registered Republicans, it leaves the board without a Democratic member. A replacement for Genovesi is expected to be named soon. A secretary for the board will also be hired.